A sequel that stays tight to the course charted by the original, Resident Evil: Apocalypse picks up the futuristic story of the zombie infection caused by the T-Virus as it spreads through Raccoon City. Alice (Milla Jovovich) emerges from a hospital facility run by the Umbrella corporation, where she has been kept sedated and injected with managed doses of the virus to change her DNA and turn her into a more proficient fighting machine. Alice finds chaos on the streets of Raccoon City: the virus is spreading uncontrollably and most of the population is infected. The zombies have taken over the streets. In response, Umbrella seals the city, leaving Alice and other survivors trapped along with the remnants of military teams who were trying to help quell the outbreak. Alice teams up with disgraced former police officer Jill Valentine (Sienna Guillory), and a few military types and other survivors. Alice is contacted by Umbrella scientist Dr. Ashford, the T-Virus creator who has been extracted out of Raccoon City but needs help to rescue his trapped daughter Angela. In return for saving Angela, Ashford will help Alice find a way out of the carnage. Finding and rescuing Angela means killing many more zombies, infected dogs, and other evil beings, and matters are complicated when Umbrella unleashes a heavily armed Nemesis monster (another T-Virus related experiment) to add to the chaos, along with plans to nuke the city. Moving the action from the artificial Hive underground facility to the urban environment provides Apocalypse with less of a designed video game feel, but also makes it indistinguishable from most other zombies-on-the-loose movies. 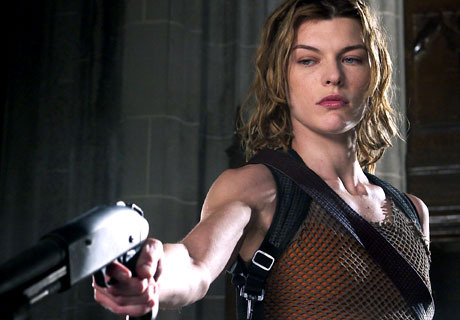 To compensate, Apocalypse benefits from adding Guillory as the ultra-cool and seriously deadly Jill Valentine. The tandem of Guillory and Jovovich manage to simultaneously celebrate women as the main zombie-killing heroines, and entrench the credentials of the Resident Evil series as a young male adult fantasy. Wrapped in a polished-enough package, Apocalypse delivers exactly what it promises: mild entertainment in the form of mindless zombie killing action, adding little that is new but not leaving out any of the admittedly limited elements demanded by the genre.